Western Europe and Canada Editor Felipe Lobo Koerich contributed to this article. French protests against a tax hike on fuel proposed by the French government turned violent as riots broke out in Paris on December 1, according to Reuters. The protests, which have morphed into a wider movement of popular discontent against Emmanuel Macron’s presidency, are known by the French name gilets jaunes (“yellow vests”) in reference to the protective outwear required for all motorists by French law, the Economist reports. The proposed tax hike would raise diesel prices by 6.5 cents and gasoline by 2.9 cents starting in January of 2019. Gasoline prices have already sharply risen in France over the course of the last year due to action in global markets. According to the Guardian, in the last year diesel prices have risen 23 percent and gas prices 15 percent. On the first day of protests on November 17, over 280,000 people took to the streets across France, the Economist reports. The protests remained peaceful demonstrations seeking the attention of the government by blocking roadways. 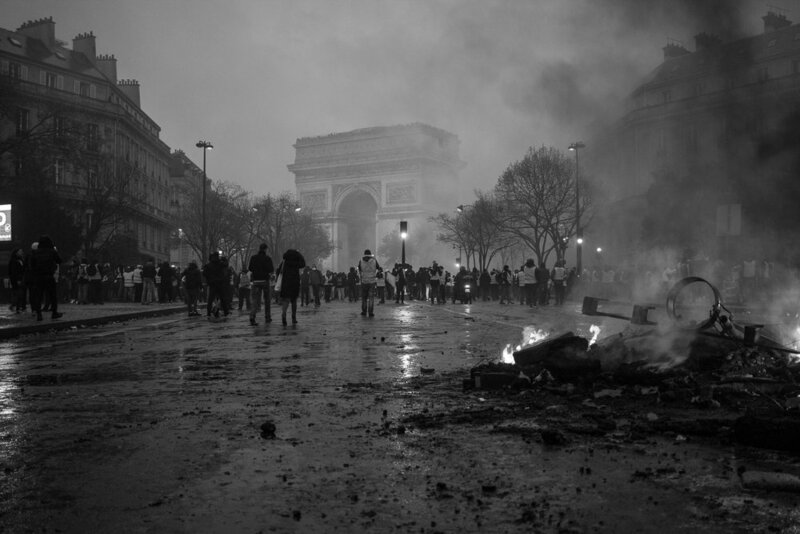 The second weekend of the protests, however, started turning violent in Paris, the Guardian reports. Protesters lit fires, erected barricades, and threw paving stones at police. The police dispersed protesters by the evening with tear gas and water cannons, according to BBC. On December 1, riots broke out in the streets of central Paris as groups of young men wearing face masks and carrying metal bars and axes set vehicles and building on fire, reports Reuters. Violent protesters torched police vans, destroyed holiday decorations, smashed the windows of stores along the Champs Elysees, and vandalized and looted banks and boutiques in central Paris. Most of the graffiti has been aimed at the government and specifically Macron, calling on him to resign or blaming him for the unrest and discontent. Later in the night, protesters scaled the Arc de Triomphe and fought against police officers firing tear gas, stun grenades, and water cannons. The riots have since died down and government estimates say 110 people were injured and 270 were arrested, according to BBC. Firefighters put out nearly 190 fires around the city. Reuters reports that police are currently blaming several hundred far-right, far-left, and anarchist extremists for the riots, claiming that they infiltrated demonstrations of nonviolent protesters to cause the worst unrest Paris has seen since protests in 2005 over the death of two young residents of the poor Parisian suburbs. Interior Minister Christopher Castaner told BFMTV, a French news channel, that “there are people who came from the ultra-right, the ultra- left, but there are also many people who just came to Paris to wreak havoc,” in reference to the protesters, according to the Financial Times. “We are in a state of insurrection; I’ve never seen anything like it,” Jeanne d’Hauteserre, the mayor of the city’s 8th arrondissement, near the Arc de Triomphe, told BFMTV, Reuters reports. Macron met with firefighters and police officers early on December 2 at the Arc de Triomphe after the riots had dissipated. Street cleaners worked furiously to clear away the burnt-out cars, broken glass, and remains of barricades that resulted from the worst day of rioting France has seen in a decade, according to the Telegraph. “What happened in Paris has nothing to do with the pacifist expression of legitimate anger. No cause justifies the police being attacked, businesses being looted, passers-by or journalists being threatened, the Arc de Triomphe being defiled,” Macron told journalists after the G20 summit, reports the Financial Times. Macron met the French prime minister, the interior minister, and top security service officials midday on December 2 to discuss the riots and unrest in Paris and across France. The French government is currently considering imposing a state of emergency to prevent another gathering of violent protesters, Griveaux confirmed to the Telegraph. The Guardian reports that Prime Minister Édouard Philippe will initiate talks with the protesters and opposition politicians next week to calm tensions and prevent future rioting by what Macron termed “professional” rioters. Plans for the fourth weekend of protests were already beginning to take shape on social media. The future of the Yellow Vest movement remains unclear. The movement currently lacks any clear structure, leader, or party affiliation and has been expanding mainly through social media, according to reports by the Economist. Without clear leadership, it will prove difficult for the French government to negotiate with the movement; however, it seems that Macron is unwilling to relent on the issue, despite public opposition and the negative press it has brought to the country.